Since the early days of TV, several larger-than-life game shows have captured viewers’ attention—but just how far can a flashy set carry a show? Television is no big thing. Just ask anybody who’s ever been to a taping of The Price is Right—or any television show, for that matter. They’ll likely tell you that the familiar set they had seen on TV so many times was, in person, downright tiny. That’s because television is a medium that thrives on the perspectives of its viewers. Our screens have the ability to make even the smallest room look as though it extends for miles. Likely influenced by their Broadway counterparts, television set designers are magicians, experts in the art of maximizing their space by any artificial means necessary. By the same token, however, big is good. Whether Adam West’s Batcave, the first televised view from space, the iconic brownstones of Sesame Street or the modern-day epic scenes from Game of Thrones, vast objects and backdrops equal captivating television for kids and imaginative adults alike. Television game shows are particularly conducive to this idea—since the early years of broadcasting, larger-than-life sets and game objects have had their fair share of screen time. 1960’s Video Village was a giant board game with living pieces. Card Sharks, and Gambit before it, were played with huge decks of cards. The Joker’s Wild featured a slot machine bigger than any you’d find in Vegas. The Magnificent Marble Machine‘s centerpiece was a monstrous pinball machine that required two people to operate. 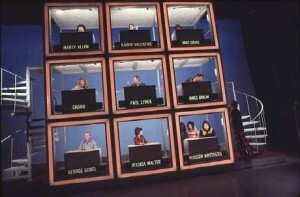 It can be argued, however, that Hollywood Squares, the three-story celebrity tic tac toe quiz, is the pinnacle of the “high” concept game show. It’s been nearly half a century since those big X’s and O’s were lit up at NBC Studios for the first time. 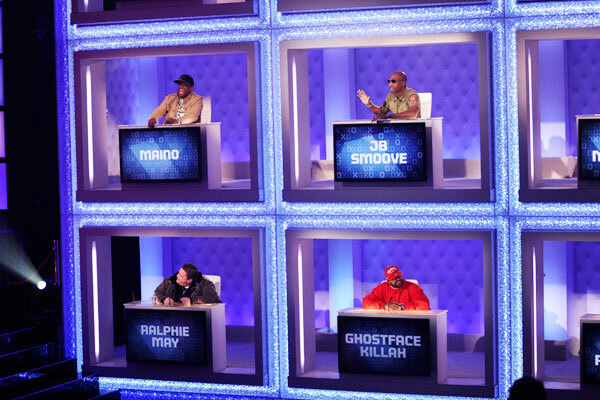 However, whether you watched Biz Markie in the center square, Whoopi Goldberg before him, or even the late Paul Lynde, the name Hollywood Squares remains familiar to several generations spanning the last few decades. Part of the reason for the show’s enduring charm is the game itself. The object is for the players to get three stars in a row, either across, up and down, or diagonally. It’s up to them to determine if the stars are giving a correct answer or making one up; that’s how they get the squares. Those simple rules, combined with the hilarious celebrities originally led by straight man par excellence Peter Marshall, made Hollywood Squares must-see TV from its beginnings in 1966 all the way up to the high-definition, hip-hop flavored early 21st century. Even as the faces changed and the hosts left and returned, the game remained solid. Ah, but that set surely must have also helped to draw some eyes to the screen, no? Well, of course it did—after all, it’s not every program that can boast a 30-foot high piece of scaffolding filled with sitcom stars and comedy writers. But on a show like Hollywood Squares, rather than the big board take preeminence over all other elements, the set exists for the sole purpose of allowing the game to shine. The arena in which the game takes place is as organic as the game itself. It’s not an architectural trade show; nobody is present to marvel at this monument constructed by a team of Burbank union workers. Once the attention shifts from the game to the board it’s played on, it’s not Hollywood Squares anymore—it’s Look How Big We Made This Tic Tac Toe Board. The powers that be at NBC would have done well to remember this lesson from their studies in 2013, when The Million Second Quiz premiered. 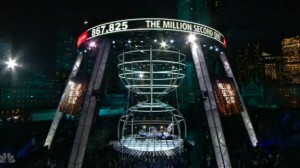 The big game show in the sky sustained itself for a total of ten days before the $2.6 million top prize was claimed. Unfortunately, it seemed as if viewers were still struggling to comprehend the rule book even as the confetti was flying. What was essentially a game of knockout was over-inflated with live visits to contestants’ homes, a Wellsian “money chair” that paid $10 a second to the sitting champ, the ability to play as a contestant via an iPhone app, and a bizarre reality television element in which the four highest-scoring players slept in Subway-sponsored private pods until the last day, sequestered from civilization. It was a far cry from tic tac toe, to say the least. Viewers tuned out in droves, and as of this year, Million Second Quiz no longer appears on NBC’s prime time schedule. But their set was a giant hourglass stuffed with LEDs and sitting on top of a skyscraper in Manhattan! What went wrong? This is what went wrong: Million Second Quiz made itself out to be a life-changing event, but in truth it was a silly trivia/reality game shoehorned into this huge, light-emitting, Seacrest-helmed space vessel. It was as if the producer walked into NBC’s offices, drew a building with an hourglass on it, said “HEY GUYS I WANT TO MAKE THIS,” and went home and built a game around it once everybody finished complimenting him on his concept and photocopying the drawing for the fridge. Whether TV executives like it or not, game shows are about one thing first and foremost: the game. 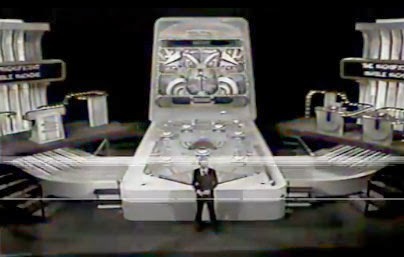 When the flashiness of a set overshadows what’s happening on that set, the game show turns into a sculpture, a pretty object from which one can expect no movement of consequence. As a lover of this genre, I long for the days when “thick” games—dynamic, intellectual activities with substance and intrigue—were the norm. However, until another major paradigm shift occurs in the fabric of television programming, game show fans may find themselves stuck in quite a few more hourglasses.